Too busy, too busy, too busy! I am a fan of “abundance”, but not in my schedule! I feel a bit overwhelmed with all that is going on the next 10 days. If you read my May Madness blog, you already know that my month of May is soooo crazy. As a mom of two school aged children it seems almost impossible in the month of May to keep my sanity. There are so many overlaps in schedules, activities, obligations and more. I felt a little overwhelmed as we finished the month out. Not only is May my son’s birthday, but June 3rd brings my daughter’s birthday too. Which means 2 birthday parties on top of all of our other events. Swim team season has begun so that puts us at the pool every day except Sunday for about 8 weeks. This year my kids swim in two different age groups, so their times are separate. I’m sure you moms can relate! I also work 3 part time jobs. Spiritually I feed myself with my job at my wonderful church www.northwoods.org . Emotionally I feed myself with my coaching business (www.yougotjoy.com) and I feed myself physically with my Juice Plus business (www.yougotveggies.com). Each of these jobs combined help me feel full, but add them onto my first job as MOM and whew whee, I’m tired this month. So, what is my point of this exhausting blather??? This… yesterday was the LAST day of May (hooray!). My last week of May was extremely packed including ending the week with a wonderful birthday party I threw one of my favorite friends, later that day was a rescheduled baseball game. Saturday included some volunteer work with my daughter through our NCL chapter and then off to a swim meet, and Sunday I taught a class at church, attended a powerful Pentecost service and a charmingly fun choir concert. Sooooo, we got home around 1:30 p.m. Now here is the dilemma. 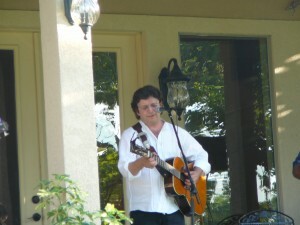 I was supposed to meet friends at 3:30 to head to a wonderful Porch Concert at the Bernhardt Winery (www.bernhardtwinery.com). It sounded absolutely delightful. And truth be told this was the FIRST thing on the calendar this month that was actually just for ME! Here’s the catch though. I was TUCKERED! POOPED! EXHAUSTED! I laid in my bed for a few minutes and tried to meditate. What was best for ME that afternoon? I very rarely find myself over-scheduled. Our family works really hard to keep balance in doing and not doing. We love to practice and excel in the Art of Nothingness! So, when I do find myself overly abundantly blessed??? with life, I know I need to roll up my sleeves and use my JOY muscle and arm wrestle BALANCE! Yes I force it into my life. Now you might be asking, “just how DO you force balance?” Sunday afternoon I took a few minutes in my garden asking myself ~ what would bring me most pleasure. ME? (reminds me of that Toby Keith song – wanna talk about me…). We had 25 women RSVP ~ yet only 10 were able to fully CHOOSE yes! Here we are enjoying an amazing afternoon! 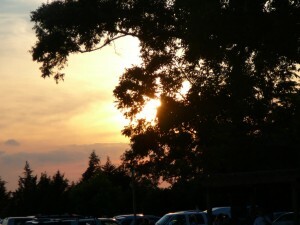 We sat under huge trees with a soft breeze blowing all afternoon evening. Shake Russell (www.shakerussell.com) entertained us with his guitar. I remember following Shake back in my post Jesuit Volunteer Days with all of my FJV buddies & Robert. It brought back a lot of wonderful memories. The night exceeded my expectations with amazing women, lots of laughter, delicious food and mostly RELAXATION.. I could feel my life slowly moving closer to balance. Then at sunset they stopped the concert to toast us all and remind us to be present and look around and truly enJOY the moment! Just Spectacular! How many of us choose to participate in something wonderful but then find excuses to allow the personal joy? So often as women, we choose everyone else and everything else BEFORE we choose us. This particular Sunday, I forced balance in my life and chose ME. Sitting in that winery (and I don’t even drink wine) I just let peace wash over me. Now, surely you know that when I woke up on Monday morning, I felt a bit crazed again. So, I did it again. Rolled up my sleeves and got downright aggressive! What Carmalyn do YOU need to survive this overwhelming schedule? I decided to stop by the public library and got myself 3 fun magical novels and 3 books on CDs. I turned off my cell phone, and promised myself that all week while running around in the car I will only listen to these fun novels on cd. At night, I will NOT turn on the TV in our room, just pull out my books. I already feel better today! I really do. I consciously am choosing to find bits and pieces in my day for ME. Can you do the same? Can you ask yourself, what do you truly need? What brings you joy? Where can you put YOU on your calendar? Start small. Be aware, notice where you are on your balance scale. Call a friend. Pray. Go to the movies. Take a walk. Eat something decadent. Close your eyes. Breathe in, breathe out. Be present right now! Choose Joy. Force Balance! enJOY your life! I totally relate to all the absurd activity. My May was the busiest on record too. With three school-aged children, and all their related activities, plus my church activiies (teaching Sunday School, coordinating S. School classes and organizing a Children’s Day party), taking tennis and Portuguese lessons, and trying to make all of my summer plans for the States, it’s been overwhelming. I’m going to take some serious “me” time soon. Or at least squeeze in some “me” moments! Thanks for the reminder, my friend! I needed that as I head into the craziest two weeks of my life! Loved the blog–we all need that. Happy to hear the Wine Tasting turned out so well! Our time with our former neighbor was also great fun! He grew up with our son and lived right next door while they were young. So blessed with friends young and old!